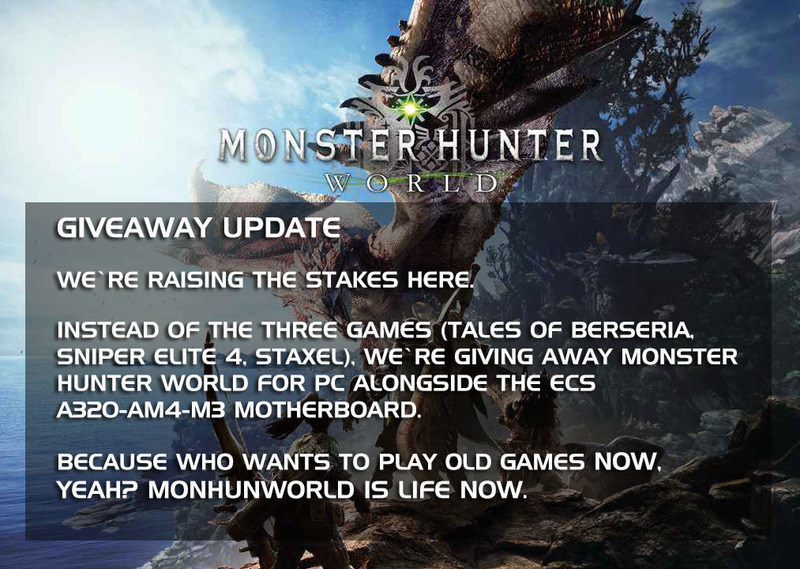 Forget those three games, we're shooting for 1 copy of Monster Hunter World for the PC instead! So, how about it? Let’s kick off August with a blast of a giveaway! We’ve teamed up with ECS Elitegroup Computer Systems to giveaway their A320-AM4-MD3 motherboard! Of course, we’re not stopping there, however. Up for grabs are a couple of games we’ve picked up lately, so give this giveaway a try! Well, as mentioned, we’re giving the ECS A320-AM4-MD3 to one lucky winner. So, yeah. This can be your fast and easy getaway to Ryzen glory for even more savings, especially if you pair it up with an APU. Now, to increase your chances of winning, we also added some prizes to spice this giveaway up so you don’t go home without bringing anything. Well, here are a couple of things you can also get. Tales of Berseria, Sniper Elite 4, and Staxel. You may want to jump in if you’re looking for a fun JRPG, you’re a good shot, or you just like to tend to your farm sim. You must be a resident in the Philippines in order to qualify for the giveaway. Just follow the Rafflecopter rules closely, and make sure you do because we check each entry. And that’s about it. Easy enough, right? The giveaway begins today and will end after three weeks, so that's until August 26th.